Set up your kettle for indirect cooking with one charcoal basket filled 2/3 full of barbecue briquettes. Light three fire-lighters and move the charcoal basket over the firelighters. Approximately 25-30 minutes after lighting, all of the coals will be ashed over and ready for cooking. Move the charcoal basket to one side of the barbecue. Place a drip pan on the charcoal grill and place two wood chunks of choice on top of the coals (we used 1x apple and 1x mesquite). Place the cooking grill on the barbecue with the grill handles over the fire, put the lid on with the vent 1/3 open. While the kettle is preheating, prepare your rib eye. Lightly coat the rib eye with olive oil and generously season with salt and pepper. After 5 minutes the kettle will be smoking and in the temperature range of 110-120°C. Place the rib eye on the cooking grill on the opposite side to the fire (indirect zone). Place the lid on and cook the rib eye for approximately 40 minutes. During the cooking time, if the temperature rises above 120°C, slightly close the vent further. Likewise, if the temperature drops below 110°C, slightly open the vent. Cook the steak for approximately 40 minutes or until the steak has reached an internal temperature of 40°C. This temperature will be perfect for a medium rare steak, cook it more or less depending on how well you would like the steak cooked. Once the steak has reached 40°C remove it from the barbecue and set aside. Remove the drip pan and move the charcoal basket into the centre of the grill. Open the top vent completely and lift the lid so it is slightly ajar, this will provide more oxygen to the fire and it will increase the temperature for the searing process. Wait 5 to 10 minutes for the temperature to rise and the cooking grill to heat up. 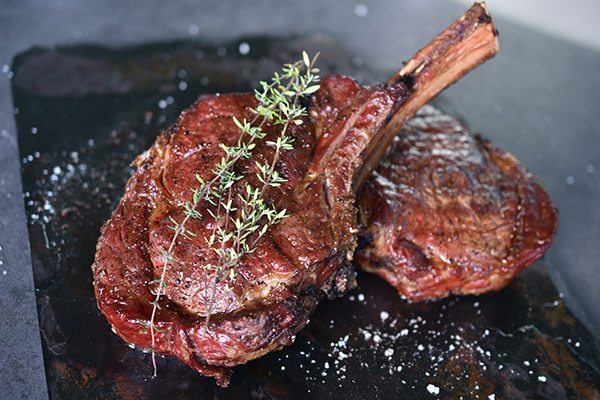 Place the rib eye on the cooking grill, above the coals, close the lid and cook for 90 seconds. Open the lid and flip the steak over, close the lid and cook for a further 90 seconds. Remove the steak from the barbecue, slice across the grain and enjoy. This recipe also pairs well with our Truffle Gravy.